I keep coming back to this one, it is such a nice system of trails and right in my backyard as well. Brian's time is stout and I did not have what it takes to match that, but I did PR by about 18 minutes over my last full run which was nearly 3 years ago, so I'm happy with that and a great day on the trails. I started at 7:15 this morning and it was nice and cool for most of my run, although as usual it was pretty warm once I popped out of Redwood and crossed over into the Chabot zone. Legs felt better than previous attempts, calves got a bit crampy in the last 8 miles or so - not sure if I was a little dehydrated or just still a bit fatigued from the Wasatch 100 2 weeks ago. Feeling pretty recovered overall so it's hard to say. Anyway, beautiful day on the trails, Brian's FKT still stands and well done to you Brian! Total time was 5:32:25, moving time 5:22:30. 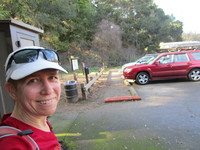 Filled up water at the usual places: Steam Trains, Sibley, Redwood gate, and The Random Water Spigot Near the End of the Brandon Trail. I'm planning an attempt on Thursday to set a women's FKT for this route. Looks like a nice set of trails. 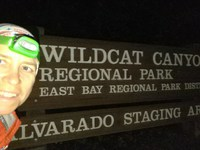 I'll be following Jim's route north-south from Wildcat Canyon (at Park Ave) to Proctor Staging Area in Chabot Park. No support except the water fountains, same as everyone has been doing so far. Looking forward to trying this one! Now that is definitely a low bar, but I'm quite satisfied with the effort. Wonderful trails! I really enjoyed the route. I was careful at intersections to not make mistakes (it's my first time through here), and I could shave time knowing the turns. I also stopped to take a few photos. Such scenery. There are some excellent runnable sections, and I was able to push the pace in the last third. I'll compile a run report in the next few days. Thank you Jim for setting up this FKT! Great Job Marcy! There are a lot of turns and they are not always obvious, so knowing the route definitely helps speed things up quite a bit. It will be interesting to see if any other women give this a go now that you have set a benchmark time! It is a great route - we are lucky to have so many miles of continuous trails so close to home in such an urban area. Thanks Allen! I agree, it would be great to see more women on the FKT board. 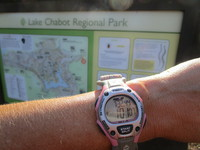 For now I seem to have my pick of FKT's to choose from where I can set the first female time (not arguing with that!). InReach tracking files are attached (10 minute intervals).